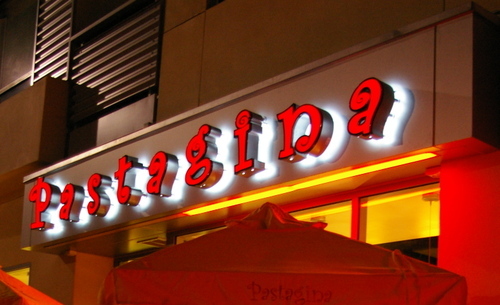 At the private party at Pastagina held last Saturday night, a staffer did say they will be opened midweek, then added a "We hope." Wednesday went by with no pasta, frustrating the 3rdBN. Last night, I stopped off Robeks Juice next door and met Pastagina owner Jong Kim who reports the opening has been delayed due to inspections; "We will be open Friday. . .I hope." Also, he's been reading certain blogs and blog comments. While shaking his head with a hidden smile, he said, "Yes, I heard about 'gina. I don't know about that name. Just come in and tell us how everything is when we're open." Via email, the introspective Militant Angleno wonders why there so much fuss about a small franchise eatery. He can understand the excitement over Ralphs. Maybe it's intriguing to watch retail development in Little Tokyo delayed by red-tape, making a contradiction of city supported changes to the cultural area as an neighborhood identity is chipped away by outside ownership–-to the fear of community leaders. Or maybe it's about writers test driving a double entendre, and resolving personal inquires about each other at the same time. It's something to talk about over pasta. Someday. Soon. Also a message from the Robek Juice counter guy; "What's with all the people taking pictures of the store?" that 3dbn looks a lot like 3rd battalion. I actually think it's 1st battalion. I can't get that outside.in site to register me as a Downtown blogger. They're registering me as a Los Angeles blogger and I can't change it. Wha-ev! As far as why we're obsessing over it, you can learn a lot about a person based on what they think of the new 'gina in town. but you can have sausage with your 'gina anywhere. sadly, some people will never get the wonders of 'gina. frankly it's their loss. i'm up for 'gina anytime after sunday night...and tuesday is bad too...but any other night next week let's eat some 'gina! The Militant pictures all those DTLA bloggers on Central Ave, faces pressed against the window, chanting, "Open Open Open!" The Militant actually finds all this fascination with the 'Gina interesting, fascinating, bizarre, silly and cute all at the same time.